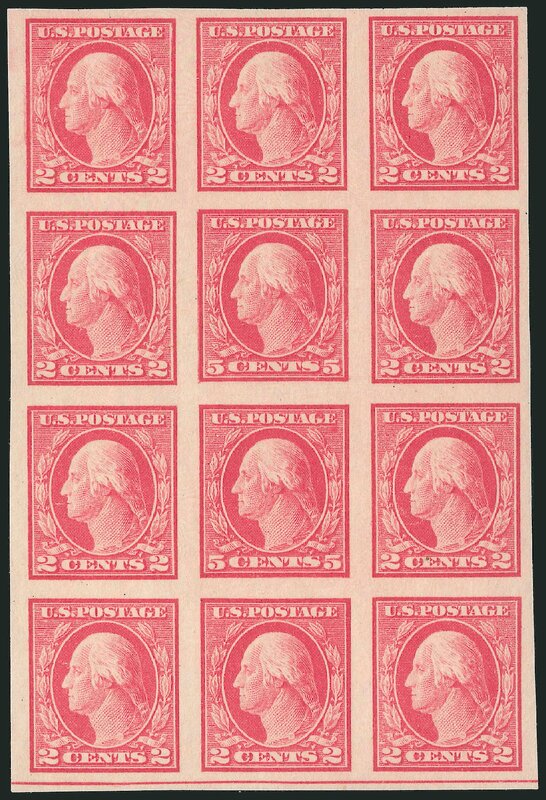 5c Carmine, Imperforate, Error (Scott 485). 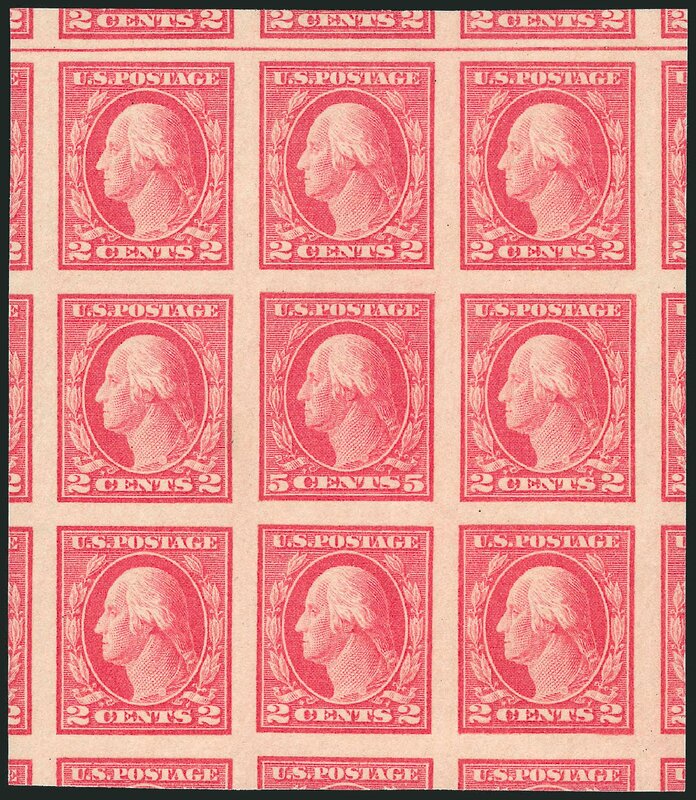 Mint N.H. single error in block of nine, huge margins showing significant portions of eleven adjoining stamps, brilliant color, light natural gum wrinkles EXTREMELY FINE. A STUNNING MINT NEVER HINGED EXAMPLE OF THE 5-CENT IMPERFORATE ERROR IN A BLOCK OF NINE. During the course of production of the normal 2c plate No. 7942, three positions were noted to be defective. The plate was returned to the siderographer, who burnished out the three positions and mistakenly re-entered them using a transfer roll for the 5c stamp. The error passed unnoticed and the sheets were issued. 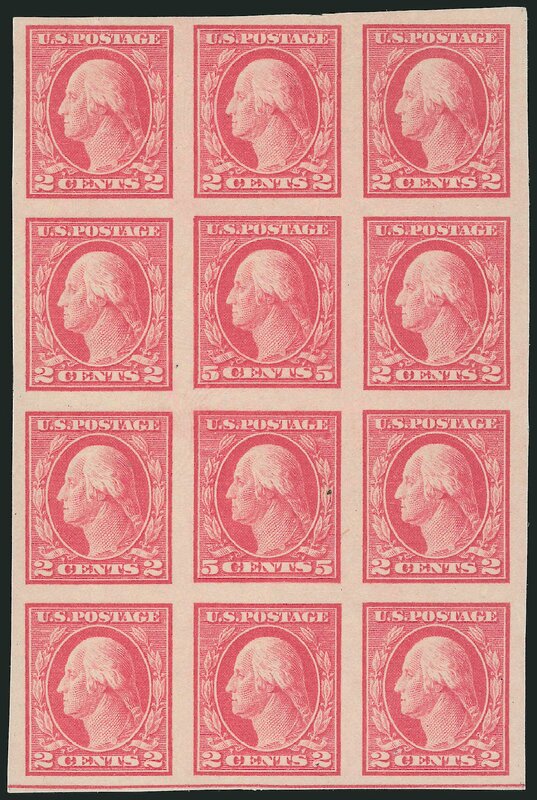 5c Carmine, Imperforate, Error (485). 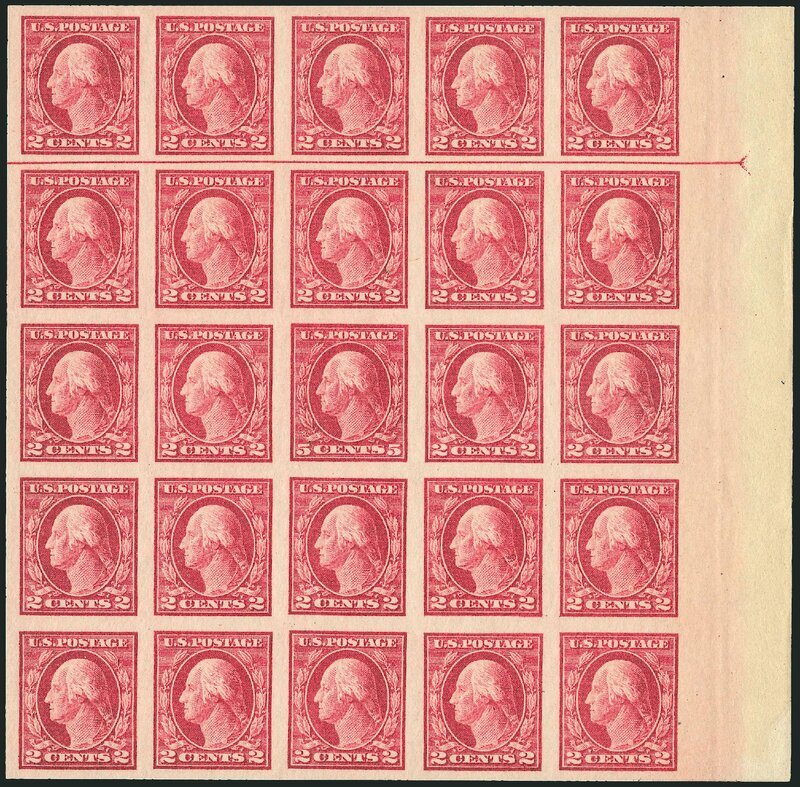 Double error in block of twelve, top row lightly hinged, others (including both errors) Mint N.H., huge margins showing parts of all adjoining stamps, bright and fresh EXTREMELY FINE EXAMPLE OF THE 5-CENT DOUBLE ERROR IN AN IMPERFORATE BLOCK OF TWELVE. During the course of production of the normal 2c plate No. 7942, three positions were noted to be defective. The plate was returned to the siderographer, who burnished out the three positions and mistakenly re-entered them using a transfer roll for the 5c stamp. 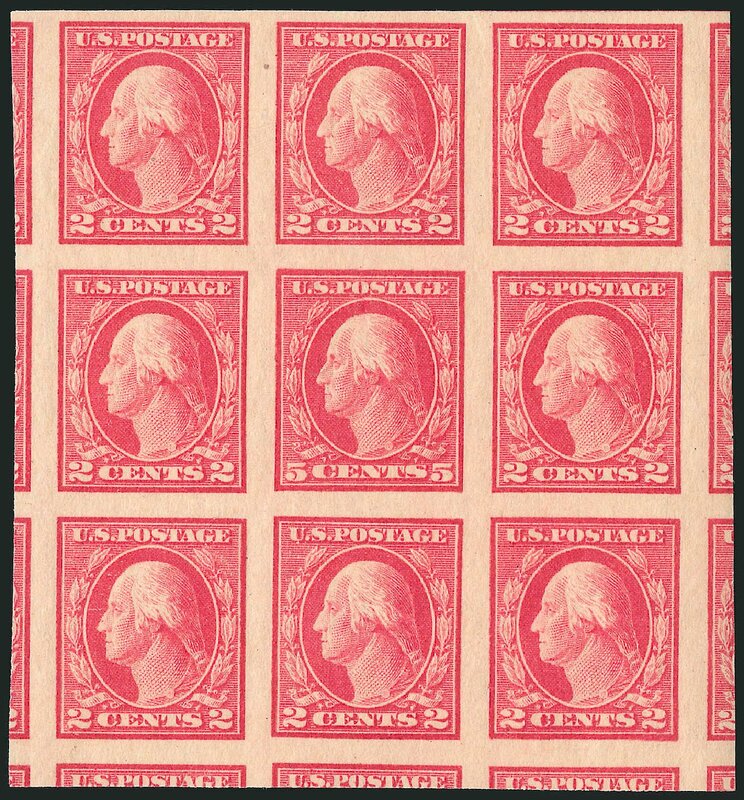 The error passed unnoticed and the sheets were issued to the public Perf 10, Imperforate and Perf 11 (Scott 467, 485 and 505). The imperforate is by far the rarest of the three. Scott Retail as hinged multiple. 5c Carmine, Imperforate, Error (485). Single error in block of nine, top center stamp the error, error and most others h.r. or lightly hinged, large margins VERY FINE EXAMPLE OF THE 5-CENT SINGLE ERROR IN AN IMPERFORATE BLOCK OF NINE. During the course of production of the normal 2c plate No. 7942, three positions were noted to be defective. The plate was returned to the siderographer, who burnished out the three positions and mistakenly re-entered them using a transfer roll for the 5c stamp. The error passed unnoticed and the sheets were issued to the public Perf 10, Imperforate and Perf 11 (Scott 467, 485 and 505). The imperforate is by far the rarest of the three. 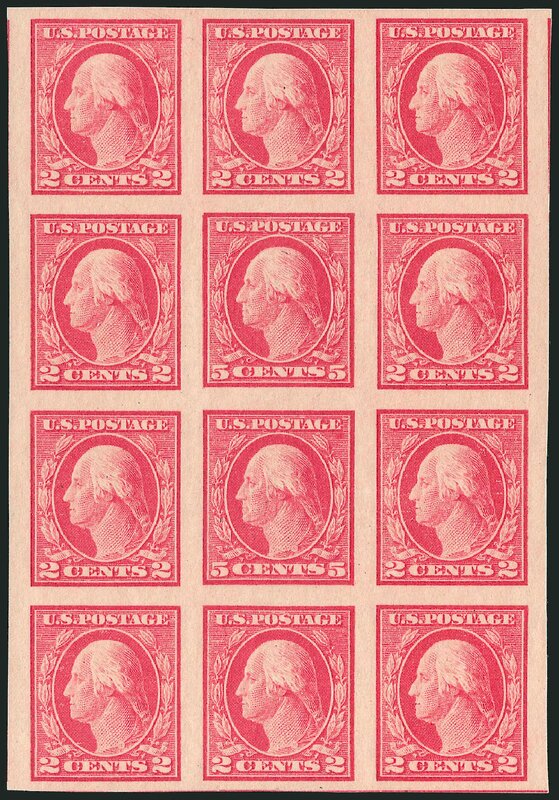 Scott Retail as error single without 2c stamps. 5c Carmine, Imperforate, Error (485). 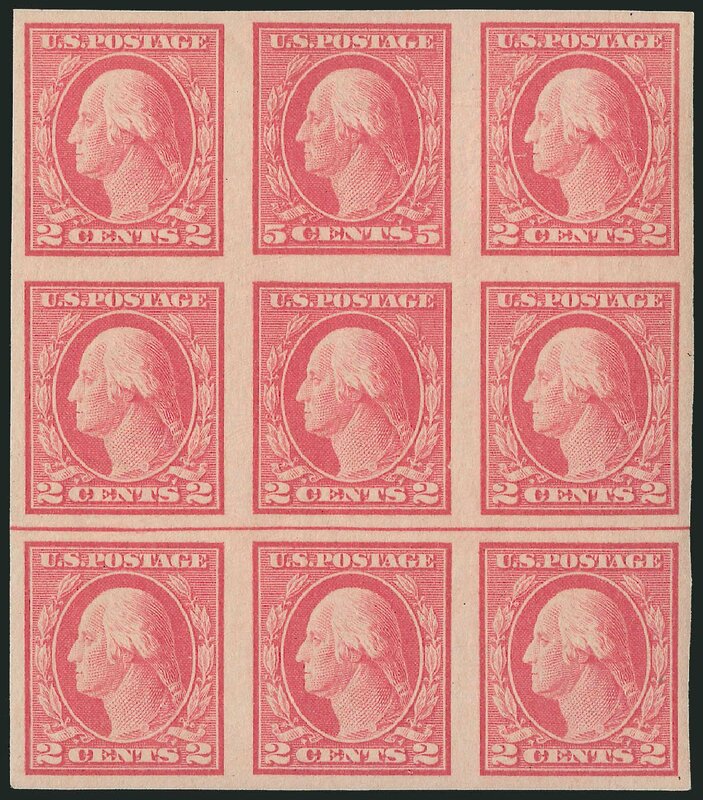 Double error in block of twelve, top row lightly hinged, others (including both errors) Mint N.H., large margins, bottom error natural inclusion and tiny gum skip VERY FINE AND CHOICE EXAMPLE OF THE 5-CENT DOUBLE ERROR IN AN IMPERFORATE BLOCK OF TWELVE. During the course of production of the normal 2c plate No. 7942, three positions were noted to be defective. The plate was returned to the siderographer, who burnished out the three positions and mistakenly re-entered them using a transfer roll for the 5c stamp. 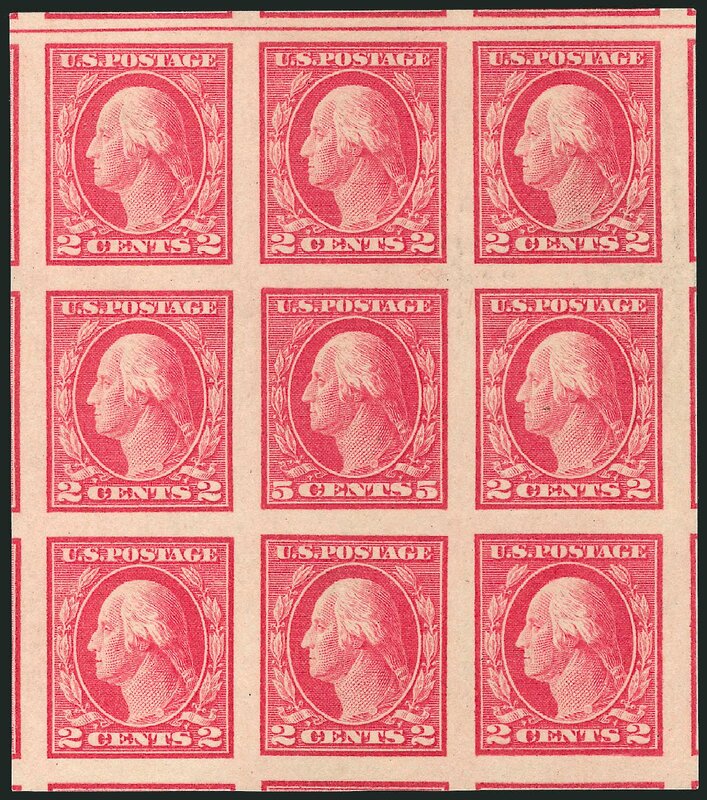 The error passed unnoticed and the sheets were issued to the public Perf 10, Imperforate and Perf 11 (Scott 467, 485 and 505). The imperforate is by far the rarest of the three. Scott Retail as hinged multiple. 5c Carmine, Imperforate, Error (485). Mint N.H., massive margins all around, including part of five adjoining stamps, brilliant color EXTREMELY FINE GEM. A BEAUTIFUL MINT NEVER-HINGED EXAMPLE OF THE 5-CENT CARMINE IMPERFORATE ERROR. During the course of production of the normal 2c plate No. 7942, three positions were noted to be defective. The plate was returned to the siderographer, who burnished out the three positions and mistakenly re-entered them using a transfer roll for the 5c stamp. 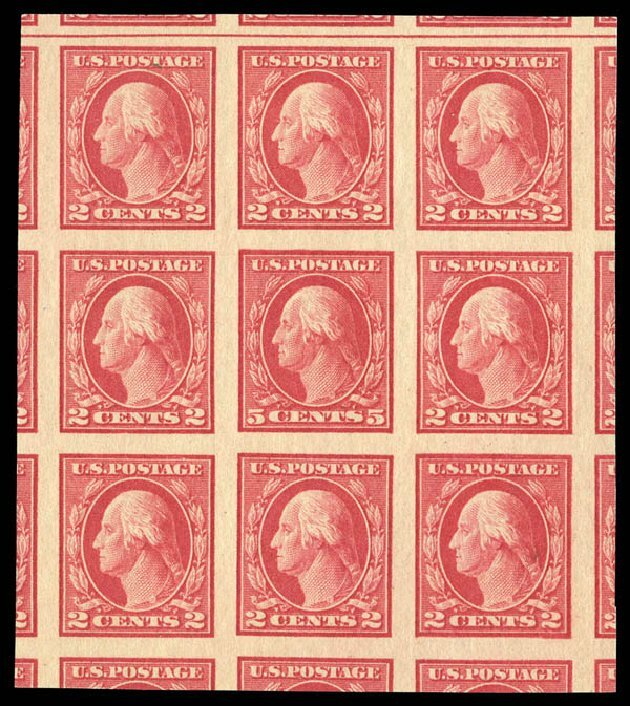 The error passed unnoticed and the sheets were issued to the public Perf 10, Imperforate and Perf 11 (Scott 467, 485 and 505). The imperforate is by far the rarest of the three. With 2010 P.S.E. certificate (Superb 98, SMQ value $25,000.00). 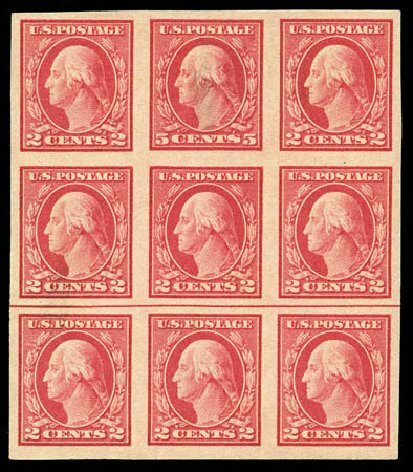 1917, 5¢ carmine error, imperforate (485), large to oversize margins with adjacent stamps visible at left and at right; also featuring choice color and post office fresh never hinged original gum; a choice, Extremely Fine to Superb Jumbo. Scott price $16,000 AN EXCEPTIONAL EXAMPLE OF THE RARE IMPERFORATE 5¢ ERROR OF COLOR. Expertization: 2004 PF Certificate. Provenance: Mann. 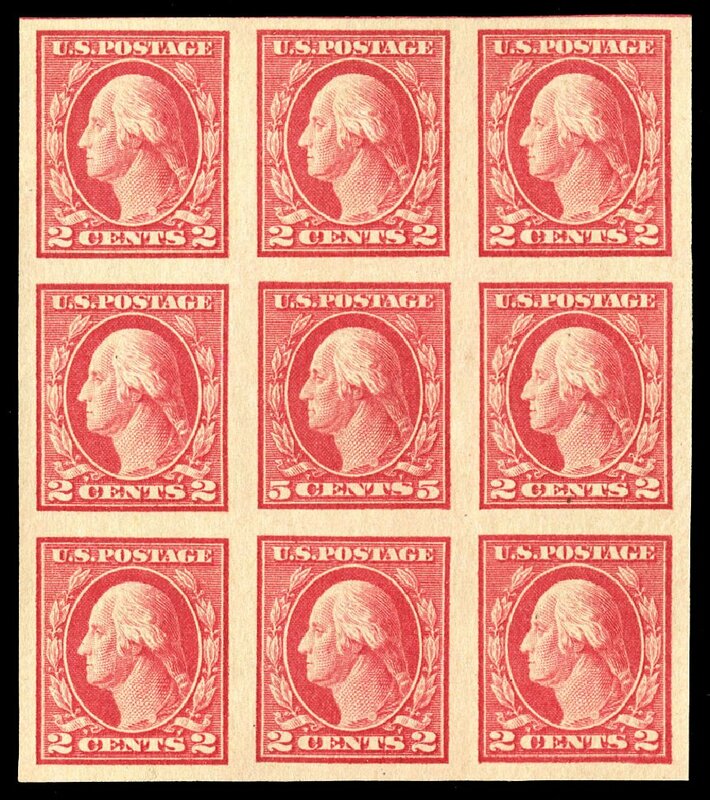 1917, 5¢ carmine error, imperforate (485), the single error in a block of nine, cut so that the block is “picture-framed” by parts of all 14 adjacent stamps; wonderfully bright and fresh with radiant color and flawless, never hinged original gum; a choice, absolutely Superb block. Scott value $30,000 A REMARKABLE EXAMPLE OF THE RAREST OF THE 5¢ ERRORS OF COLOR IN THE FINEST POSSIBLE CONDITION. Expertization: 1974 and 2008 PF Certificates. Provenance: Minervino. Reportedly, New York City was the only post office to receive a supply of 2¢ imperforates printed from plate 7942, the plate containing the 5¢ errors. They sold only 48 uncut sheets of 400 before the error was discovered and recalled by the Bureau. Each of the 48 sheets contained three errors, making a total of 144 the maximum number that can exist, and only 48 each of either the single or the double error blocks. Undoubtedly, some of those 96 blocks have been cut up. (e.g., see our preceding lot). 5c Carmine, Imperforate, Error (485). Single Mint N.H. error in block of nine, huge margins all around including part of all sixteen adjoining stamps, lightly hinged at top and bottom, two side stamps also Mint N.H., brilliant color EXTREMELY FINE GEM. 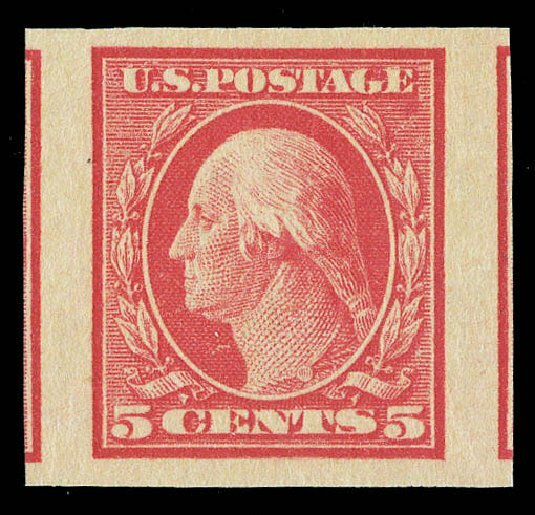 A STUNNING EXAMPLE OF THE 5-CENT IMPERFORATE CARMINE ERROR IN A BLOCK OF NINE, WITH THE ERROR AND TWO SIDE STAMPS IN MINT NEVER-HINGED CONDITION. During the course of production of the normal 2c plate No. 7942, three positions were noted to be defective. The plate was returned to the siderographer, who burnished out the three positions and mistakenly re-entered them using a transfer roll for the 5c stamp. The error passed unnoticed and the sheets were issued to the public Perf 10, Imperforate and Perf 11 (Scott 467, 485 and 505). The imperforate is by far the rarest of the three. 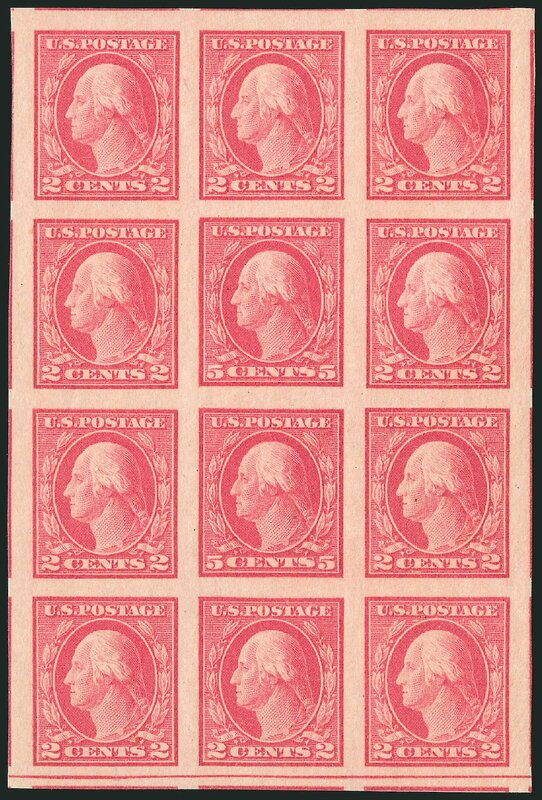 5c Carmine, Imperforate, Error (485). Double error, Positions 74/84 in Mint N.H. pane of 100 with plate no. 7942 at left and top, brilliant color, few trivial natural inclusions well away from errors EXTREMELY FINE. A BEAUTIFUL MINT NEVER-HINGED INTACT PANE OF 100 CONTAINING TWO OF THE IMPERFORATE 5-CENT CARMINE ERROR. AN IMPRESSIVE MULTIPLE. During the course of production of the normal 2c plate No. 7942, three positions were noted to be defective. The plate was returned to the siderographer, who burnished out the three positions and mistakenly re-entered them using a transfer roll for the 5c stamp. 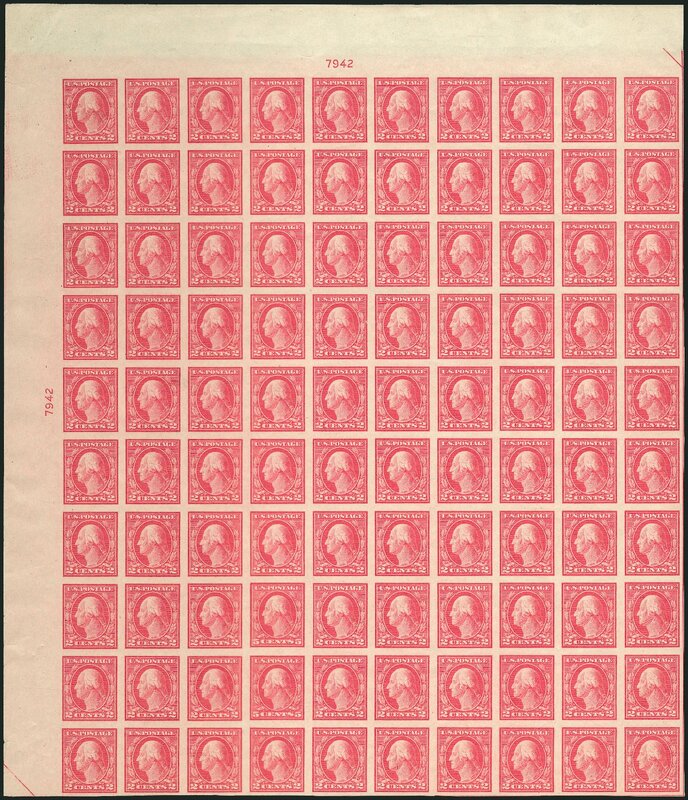 The error passed unnoticed and the sheets were issued to the public Perf 10, Imperforate and Perf 11 (Scott 467, 485 and 505). The imperforate is by far the rarest of the three. Small backstamp at lower right well away from errors. 1917, 5¢ carmine error, imperf (485), top middle stamp in a block of 9. 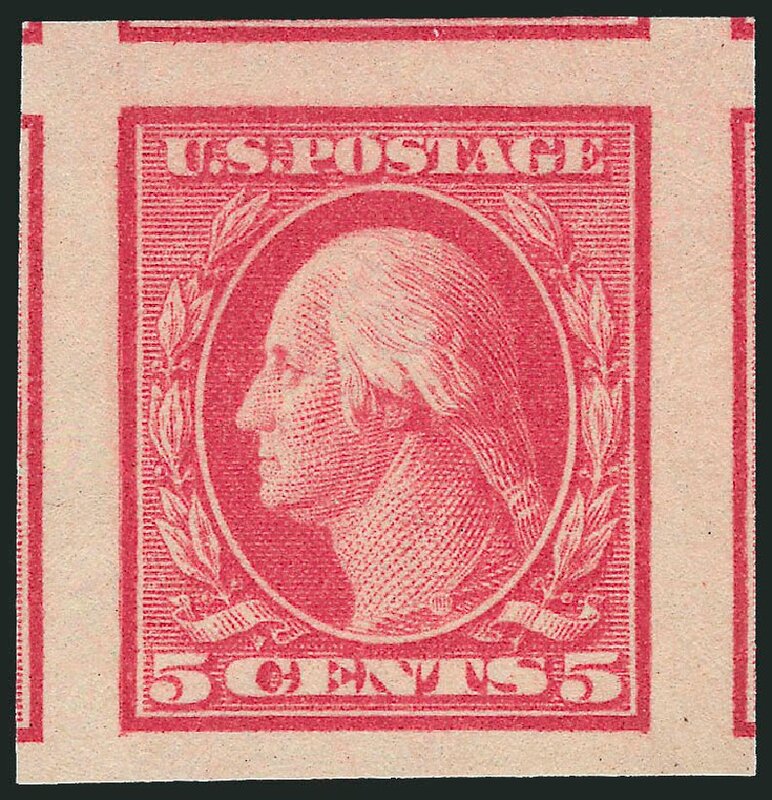 Fresh color, large margins all around, couple small light inclusions, including one in 5¢., o.g., some small light thinning including a small spot in the 5¢, Extremely Fine appearance. Scott price $9,000 as single AN ATTRACTIVE EXAMPLE OF THIS RARE IMPERFORATE ERROR OF WHICH ONLY 50 SHEETS ARE BELIEVED TO HAVE BEEN ISSUED.